An unconventional British gal with a degree in International Relations, the wrong side of 35 who finds herself living in the unconventional country of Greece. 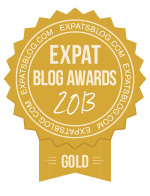 ExpatsBlog.com Expat Blog Awards 2013: Greece Gold Award! This blog won the Gold Award for best expat blog in Greece! 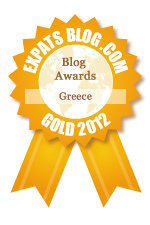 ExpatsBlog.com Expat Blog Awards 2012: Greece Gold Award! Long time ago, I started reading and following Bex's blog Leaving Cairo out of a common interest in the Dodecanese islands in Greece. And during that time, her posts have been expanding the universe in the blog, so that today besides the great stories of Greek everyday life on a small island the scope is broader and have become one of my favorite expat sources as well. Reading the blog is leaving me every time with a smile and some more thinking. Thanks!! Beccy knows, lives in, loves and promotes Greece in a time when the international media is negative and 'cutting and pasting' every negative comment they can find. Isn't it better to cut and paste a comment from Beccy once in a while? Great blog! Beccy's observations are fun and spot on. Bex has an exciting blog where she shares life in Greece and offers interesting observations about cultural differences. She makes me want to pack my suitcase and take a trip to Greece. I'd love to meet Bex in person. Lovely observations on everyday life, eagerness to understand greek everyday culture on a warm personal note! Refreshing, with equal portions of humour and seriousness, Bex's blog speaks from the heart to the heart! Bex's love for Greece is the real deal. She has lived there, worked there, travelled, hosted others, and hung out there. She has poured herself with creative concern into her many students. She has also come as a student herself--eager to learn about the people and ways of her adopted country. Yet hers is not a Pollyannish or blind love--she sees the warts as well. But she knows that warts are OK. They make the country and its people ... and her keen observations on both ... human and believable. Bex has travelled to and lived elsewhere, so her attraction for Greece is not simply a passing infatuation with being in some exotic foreign country for the first time. Bex is full of life and energy--witness how long she has been writing about her new home and about how many varieties of facets she has explored. She wishes well for the place. Her blog and her observations are first-person, witty, and worthy of consideration by anyone who wants a window on one of the cradles of Western civilization. Just discovered this blog and I am loving it. I lived in Greece over 22 years. But before leaving the country, I had the pleasure of meeting Bex. I had stumbled through her blog and became hooked! She has a unique way of describing her experiences in Greece....raw, pure and realistic. Having lived there for so long, and understanding the dynamics of the Greek people and the country, I could say that Bex depicts the Greek culture head on. Her sense of humor and courage to say it like it is, makes the this blog an addiction and a must read!!!! Keep writing Bex! Always interested in what you have to say!!! Bex has an uncany knack of putting into words things that we all see, hear and think about but don't verbalise. Her blog has a refreshing honesty about it but her love for her adopted country shines through. Always topical, interesting, and entertaining. Bex's evident and tangible passion for Greece animates everything she writes. Excellent blog. A very engaging and insightful blog full of useful information and wonderful snapshots of a mesmerising country that despite its current economic woes, remains vibrant and brimming with character. Bex's love for the country and its people is evident in her lively and considered writing. A great blog with a useful insight into the world of Greece. Loving the LEW articles each week which provide all us expats with another look on life and remind us that we're not alone in this crazy expat world. Keep up the good work Bex! Thanks! Bex's blog is a highly dangerous tool for a person like myself who can while unknowingly spend hours going deep into an interesting website. Leaving Cairo is not documents various events and aspects of Greek culture, but also documents Bex's own experiences and musings on the ins and outs of expat life. Her League of Expat Writers series and frequent book reviews give readers the chance to broaden their own world view and exposes other writers to her ever-increasing group of fans. Leaving Cairo has a lot to offer! Your Name Do you think this blog has what it takes to be listed at the top of Expats in Greece Blogs?